I rounded out of winter with a serious hankerin' for dandelions. It's not just that they sounded sortakinda good. I had a bone-deep craving for them. January and February didn't cooperate. They were very dry and the plants weren't feeling the love. Then a weekly pattern of snow and cold set in, which further delayed the plants emerging. But you've gotta believe that when those first tender dandelion leaves poked through the dirt, I pounced on them (I was going to make the analogy, "like a mountain lion on a jogger," but I guess that probably wouldn't go over very well. If I only make the bad joke within the safety of parentheses, it doesn't count). The first thing that struck me when I started harvesting the dandelion leaves was how much the leaves smelled like the dandelion flowers we all know so well. That surprised me. Had I forgotten it over the off-season? Was it something I simply took for granted in the past? After a long winter, that smell was downright bliss-inducing. I guarded my little dandelion brood with great care. Each time the snow and freezing temps would revisit, I'd head out to the garden and cover them with a few inches of straw. When the sun returned again, I'd clear the straw away. My neighbors laughed at the attention I gave those silly "weeds." But those weed were to me like honey to a bear (see, a nice safe analogy). 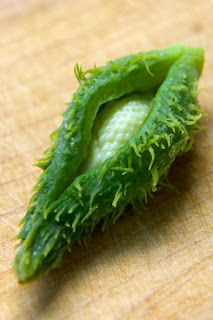 At first, I'd just stuff the leaves into my mouth raw, delighting in their fresh greenness after eating pickles and preserves for so many months. Next, as they became more abundant, I'd saute up big pans full of dandelion leaves. I was still so hungry for them that I'd burn my fingers trying to sample bites right from the pan. Eventually, as my dandelion cravings became slightly less desperate, I came up with this recipe. I'm pretty sure that I could get anyone to declare that they enjoy dandelion greens with a slice of this pizza. Imagine, the slight bitterness of dandelion greens set off by a garlic-y white sauce, smoky bacon, sweet onions, and spicy pickled peppers. It's so good that I'm tempted to describe it in an embarrassingly cliche way like, "it's a party in your mouth." Oh yeah, I went there! Don't worry, though. I won't go so far over the line as to start saying words like foodie or yum-O. 1. Roll your pizza dough into a 14" circle. 2. Spread the white sauce over the raw pizza dough. 3. Heat a heavy bottomed over medium heat. Add the bacon, and let it cook until the fat has rendered out, and the pieces become crispy. Fish the cooked bacon pieces out with a spoon, and reserve them for later. 4. Add the sliced shallot the the pan, along with a pinch of salt, and stir it around to get it coated in bacon grease. Let the shallot cook in the pan until it becomes translucent and starts to take on a little bit of brown. Add the dandelion greens, and stir them until they are also coated in the bacon grease. Add another pinch of salt. 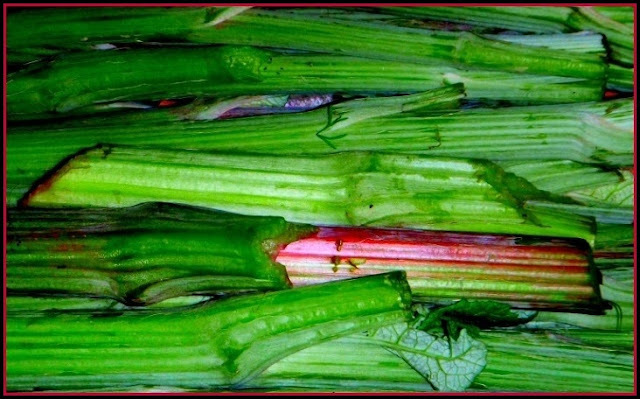 Cook the dandelion greens until they have wilted and turned a deep green. 5. Turn off the heat, and add a generous splash of vinegar. This is very important, as it will help to tame the bitterness of the dandelion greens. Plus, it just tastes stinking fantastic. 6. Sprinkle the cooked dandelion/shallot mixture over the pizza. Use your fingers or a fork to make certain that the dandelions are evenly distributed. 7. Next, add on the pickled peppers (the sweet tangy heat of these peppers is key to the flavor balance of this pizza, I get mine from the local grocery store olive bar), the cooked bacon pieces, and the melty cheese. Press down lightly on the whole works. 8. Cook your pizza in the hottest oven possible until the crust is cooked all the way through. Look to your original pizza crust recipe to see how long this will take. All of the other ingredients are cooked, so you only need to bake the pizza long enough to cook the crust and make the cheeses bubbly. 1. In a small heavy-bottomed pan, melt the butter over medium-low heat. 2. Add the grated wild onion, and let it sizzle until it becomes fragrant. 3. Add the flour, stirring to combine it with the butter. Continue stirring, and let the mixture cook for a minute or two. 4. Stir in the salt, pepper, and herbs. 5. Slowly whisk in the milk. Continue to gently whisk the sauce as it continues to cook. Let it remain on the heat until it thickens to the consistency of pudding. 6. Remove the pan from the heat, and stir in the hard cheese. 7. Let the white pizza sauce cool to nearly room temperature before using it on raw pizza dough. Didja cook it with the Pizzazz? This pizza is AMAZING. Again, speaking from experience. It's breakfast time but I want this pizza right now. You sure make a good looking pizza. Could I use the whole dandelion plant in this recipe? I'm going to be weeding them out of my garden this week. Absimolutely. Dandelion crowns are my favorite part. Flowers will work just fine. Also, if the root doesn't provide resistance against your knife, chop it up and include it as well. If the root is too tough, cut it into pieces and save it for medicine. 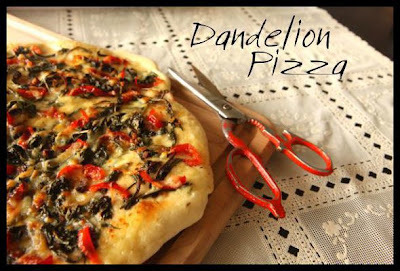 I'm going to run out to find some dandelions right now, just so that i can make this pizza. It looks so good! I've never heard of those peppers before, but now I really want to try them. It's hard to find a pickled pepper that isn't bland or too hot. And if they are perfect with dandelion pizza, all the better. These peppers are a little on the sweet side, but they also have a pleasant rising heat. Slivered up into small slices, they bring such a perfect balance to this pizza. It wouldn't be the same without them. I love that you turn forage into these recipes that look so fancy, but not fancy like food that happens in a restaurant and I'd never make in a million years at home, fancy in a way that I can do. I've been meaning to say that for a while. Thank you, Marnie. That makes me so happy to hear. Love the joke. A lady got 'et' a mile or so from my house. It is what it is. How did I miss this one???? Wow. How lucky are the people who get to eat at your house? I like the idea of trying wild foods on pizza. Gives it a nice familiar look, but delivers a fresh taste. This looks so good. I think I could even get my kids and hubs to eat dandelion greens this way. Great recipe. Is this the same recipe that appeared in the paper? The picture seals the deal for me. Looks so amazing that I may grow a whole yard full of dandelions just so that I can have pizza.